Start with your assignment! 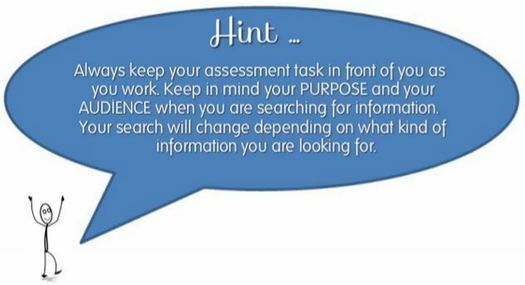 Always read the assignment carefully and keep it in front of you at all times so that you can makes sure you are finding information that will actually help you answer the question. A quick way to find out more about Social Media is to do an internet search but remember to think critically about which websites you use. For example, the Definition of Social Media website is probably more reliable than Wikipedia. You will need to decide on which aspect of Social media you wish to explore and choose your keywords FIRST. Social Media as an idea is HUGE, so you need to narrow it down first. Also, here is the general EPIC link. Your teacher has the username and password for you. Think about your search terms before you begin. Use "quotation marks" to keep your search terms together in the search. Assess each site using the CRAP test. you should know about them ..."
Search the Stuff.co.nz site for newspaper articles about your chosen topic. Search the NZHerald.co.nz site for newspaper articles about your chosen topic.